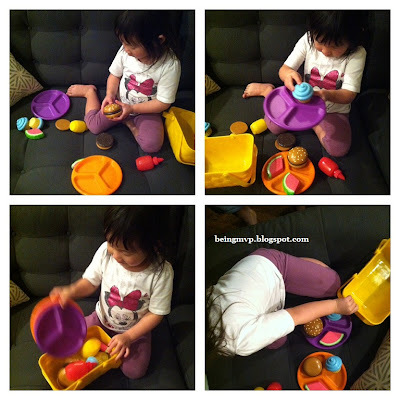 being MVP: Learning Resources: New Sprouts Picnic Set & Giveaway! Learning Resources: New Sprouts Picnic Set & Giveaway! Kenzie's fascination with play food is still going strong. She is thoroughly enjoying all her Learning Resources play food so imagine her delight when she saw the New Sprouts Picnic Set? She immediately started naming off the food items (through the plastic) and wanted me to open asap. When I opened the box Kenzie went right to putting together the picnic foods starting with the burgers. The Picnic Play Food Set includes 15 pieces: durable plastic basket with handles, 2 divided plates, 2 mini-hamburgers (buns and patties), 2 watermelon wedges, 2 cupcakes, and ketchup and mustard bottles that "squirt." When Kenzie discovered that the mustard and ketchup had strings that came out to imitate squirting, she could not get enough of it. She had fun putting it on the burgers then pushing it back into the bottles. Kenzie even sat herself down at the dining table and fixed us dinner. She was so enamored with her picnic food that somehow I found pieces in her bath (it was Hubs' turn). I do have to note that she will not be taking these into the bath because the buns have small holes that water can get through and I'm not a fan of possible mold. Learning Resources has yet again amazed me with their educational toys for 2013. They have a great selection to keep your child entertained and always learning. Buy It: You can purchase the New Sprouts Picnic Set for $24.99. One Winner will Receive the New Sprouts Picnic Set! I'd like to have the New Sprouts™ Fresh Picked Fruit & Veggie Tote for my grandsons! The New Sprouts™ Cure it! My very own doctor set is so cute! My grandsons love to play "store" so the New Sprouts™ Ring It Up Cash Register - My very own cash register would be well loved. i like the pretend and play school set. love love love the 'all about me family connections' ... endless play! I like the New Sprouts™ Breakfast Basket. I love the Little Sprouts food line. I really like the Little Sprouts Deluxe Market Set. I like the Primary Science Jumbo Magnifiers with Stand. I would also love the Primary Science Plant & Grow Set! I would love to have the Primary Science Sensory Tubes. I like the New Sprouts™ Ring It Up Cash Register - My very own cash register. Time Tracker® Visual Timer & Clock would be helpful here. I like the GeoSafari® Talking Telescope. I like the primary science mix and measure set. I like the New Sprouts™ Fix it! My very own tool set. Is the whole site an option? I was blown away by the selection for toddlers. I like the learning gears. I would also like to have their Smart Snacks Alpha Pops. The Alpha Bug Step N' Spell! New Sprouts™ Cure it! My very own doctor set - my daughter would love it. I love the New Sprouts Cure it! I like the POP for sight words game. My daughter would love the New Sprouts Ring It Up Cash Register! The Jumbo Pets look very nice! I would like to have the Pop for Sight Words™ 2 Game! I would love to have the New Sprouts™ Breakfast Basket. I like the New Sprouts Dinner Basket! My kids would love the Playfoam Combo 20 Pack.